In lieu of flowers, gifts may be made to the Eric W. Fonkalsrud, M.D. Endowed Chair in Pediatric Surgery at UCLA. Please call (310) 206-6772 to make a credit card donation over the phone. We are deeply saddened to report that Eric W. Fonkalsrud, founding chief of pediatric surgery at UCLA, died on April 6, 2017. Dr. Fonkalsrud was 84 years of age. A native of Baltimore, Maryland, who grew up in Seattle, Washington, Dr. Fonkalsrud received a Bachelor of Arts degree from the University of Washington, where he was a member of the national champion crew from 1950-53. He received his medical degree from Johns Hopkins University. Following internship and a year of residency at Johns Hopkins, Dr. Fonkalsrud completed surgical residency at UCLA, followed by training in pediatric surgery at Children’s Hospital of Ohio State University. He returned to UCLA in 1965 as chief of pediatric surgery and spent the remainder of his illustrious career here in Los Angeles. He became professor of Surgery in 1971 and served as executive vice chair of the Department of Surgery from 1982-88. He became emeritus professor in 2001. Dr. Fonkalsrud was a busy clinician who performed more than 15,000 operations during his career. 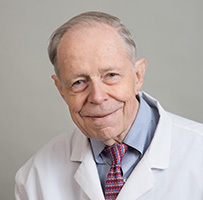 He was a world authority on the management of congenital chest wall malformations and gastroesophageal reflux disease in children, neonatal surgery, and management of inflammatory bowel disease in children and adults. Dr. Fonkalsrud had one of the country's largest clinical experiences with the ileoanal pouch procedure for patients with severe ulcerative colitis. He also initiated liver transplantation at the UCLA Medical Center in 1968, using a heterotopic technique different from the orthotopic approach now in use. Dr. Fonkalsrud was an international figure in his field. He served as president of the American Pediatric Surgical Association, the Society of University Surgeons, the Association for Academic Surgery, the Pacific Coast Surgical Association, the Pacific Association of Pediatric Surgeons, the Southern California Chapter of the American College of Surgeons, and the Los Angeles Surgical Society. Among his many honors and awards, he was a James IV Association Traveling Scholar, and he received the Coe Medal from the Pacific Association of Pediatric Surgeons “for lifelong contributions to the field of pediatric surgery”, the Golden Apple and Golden Scalpel Awards at UCLA, “Man of the Year” from the California Chapter of the Crohn’s and Colitis Foundation of America, and the UCLA Dickson Emeritus Professorship Award in 2014. He was particularly proud of his award as Forest Farmer of Year in Western Washington in 1997. Dr. Fonkalsrud was a consummate educator and mentor to thousands of students and residents. More than a dozen of Dr. Fonkalsrud’s residents and research fellows went on to train in pediatric surgery fellowship programs. He took this role so seriously that he continued weekly teaching conferences with residents and students through his entire retirement and only suspended these a few months ago when his health required him to do so. Generations of trainees will remember learning about pediatric patients and their surgical problems from Dr. Fonkalsrud, fortified by popcorn and soda in his office on the 7th floor of CHS. Rick, as he was known to so many of us, was a great friend who lived life to the fullest. He was an avid athlete, indeed a competitive triathlete, a devoted swimmer. He was thoroughly dedicated to the University and the School of Medicine. His career spanned the period of growth and maturation of our School, and he contributed measurably in many ways that make us the institution we are today. Dr. Fonkalsrud is survived by his wife Peggy, their four children Eric Jr., Lynn, David and Robb, and six grandchildren. We extend our heartfelt condolences to all of the Fonkalsrud family for their great loss.